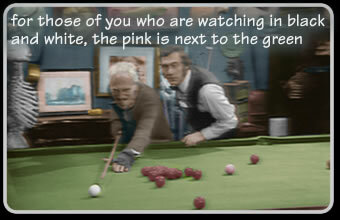 These Episodes of Steptoe and Son were originally broadcast in colour. Now only black and white versions exist. Do you have them ? Do you know anybody who might have them ? Thank you to Phil Glass for the Excellent Colourization work on the Pot Black Image. Please support our campaign to find lost colour episodes of Steptoe and Son - A British Comedy Classic ! During the history of humanity there have been some outrageous and scandalous assaults on precious works of art. Napoleon using the Sphinx for rifle practice, the Churchill’s destruction of the Graham Sutherland portrait and the Nazi’s systematic seizure of art collections across Europe. Comparable with these atrocities was the BBC’s total inability to maintain its own library of unique comedy, drama and other broadcasts which are now regarded as national treasures. In many cases the BBC made a conscious decision to erase many of its own recordings. While there is nothing to be admired or respected about any aspect of the Nazi regime, at least with respect to art their intention was not to destroy but to preserve, albeit for their own selfish advancement !!!! The most heinous of all the BBC’s failings in maintaining its own library was the treatment of the Steptoe and Son canon. The UK’s first true sitcom in the format we now know and understand it. So poor is the BBC’s management in this area that they honestly don’t know what they have done with two entire series. They don’t know if they have been erased or just lost. For all we know they could be gathering dust in some broom cupboard in Wood Lane, but to all intents and purposes they have been lost to the world for decades. To make the matter even more painful the episodes that are lost are the very first that were broadcast in colour. All but two episodes from Series 5 and 6 have been lost. All that remains are 13 poor quality home recorded black and white copies. These were the first series in over four years and reflected the change in colour broadcasting that occurred during this period. Episodes such as “Pot Black” and ironically “The Colour Problem” were made specifically for colour television. Strangely enough nobody now regrets this poor management of the archive more than the BBC themselves, as they have realised the enormous value these recordings. Sales of DVD’s and the expansion of both satellite and digital TV with numerous channels looking for material to broadcast mean that these lost episodes represent a real commercial opportunity for the Corporation. Once again, while publicly denouncing home recording, the BBC finds itself reliant on enthusiasts and collectors to close gaps in their library. Do you have any of the lost Steptoe episodes ? While poor quality Black and White versions of the lost colour exist (and have been released), we believe that colour recordings must exist somewhere. This site is appealing to all its visitors to look at their own Video collections to see if one of these lost colour episodes is sitting on a VHS or Betamax tape that is laying forgotten in some dark corner or your video collection. The people who have these recordings most probably don’t know that they are very much in demand and will be unaware of their importance. Please if you believe you have one of the lost colour recordings please contact this site (in complete confidence if you wish). Please help us to find some lost comedy classics.